A US Airways flight with 34 people aboard was forced to make a dramatic belly landing at Newark International Airport last night. Terrified passengers managed to escape the plane unharmed after the plane’s pilot – named by witnesses as Edward Powers – performed a heroic emergency landing. 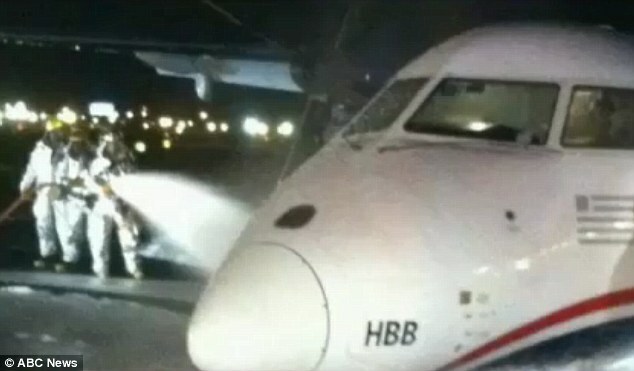 Video footage of the turboprop twin-engine plane coming down on the runway showed a dramatic shower of sparks flying from its underbelly as it scraped across the tarmac – however, miraculously no fire was started. Emergency workers on the ground doused the plane in foam as a precaution but it became clear that the actions of the quick-thinking pilot had saved US Airways Express Flight 4560. 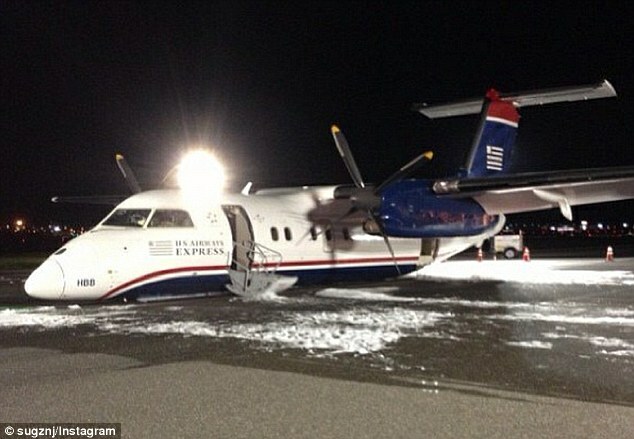 Problems emerged as the Dash 8-100 plane operated by Piedmont Airlines, which was carrying 31 passengers and three crew members, came in to Newark around 1am having left Philadelphia two hours earlier. 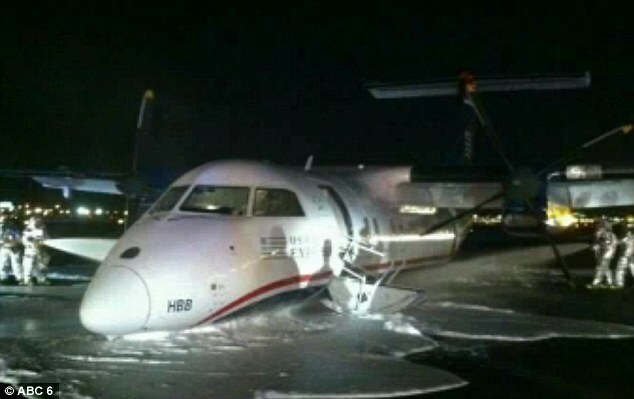 Mr Powers was unable to fully lower the plane’s landing gear. Circling in the air several times the pilot repeatedly tried to lower the gear but to no avail. He then realized it would be necessary to raise the gear completely and make a belly landing which would give the plane a good chance to come down safely and lower its chances of veering off the runway. He then continued to circle – using up fuel to lower the risk of a fire. On their safe arrival the passengers were evacuated to the terminal by bus. 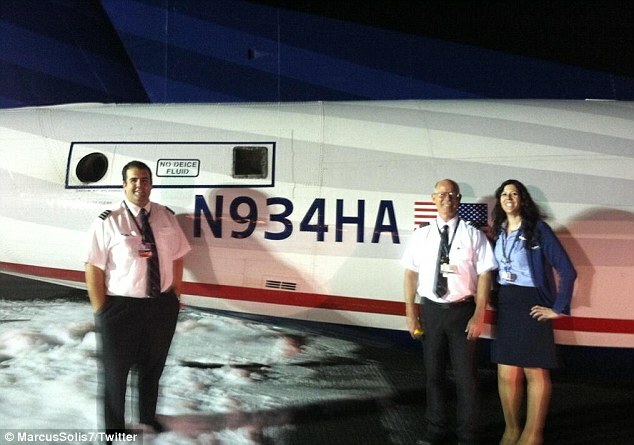 The relieved pilot and his two crew members posed for a picture alongside the foam covered aircraft. A spokesman for US Airways said they are cooperating with the National Transportation Safety Board which is investigating the incident. He also paid tribute to the work of Mr Powers. ‘The landing of the aircraft on the ground safely is testament to how well our crews are trained. They are trained to think quickly and assess the situation and act with the utmost professionalism,’ he told Mail Online. There has been no reported disruption at the airport although one runway remains closed as investigations continue.